Whether you enjoy feathered visitors to your yard or feeding station or you regularly travel to wildlife refuges and nature preserves to see a wider variety of species, migration is always an exciting time to see birds. Understanding the seasonal bird migration schedule can help you be ready for the arrival and departure of all types of amazing birds so you don't miss a moment of their movements. Species: Different bird species have different migration schedules depending on their individual needs, including their overall range and the length of their migration. Birds that migrate over larger ranges typically start their migration earlier than short-distance migrants. The age and gender of birds can also affect their migrating schedule, with mature males often migrating first to claim territory, followed by mature females looking for mates and last are juvenile birds making their first migrations. 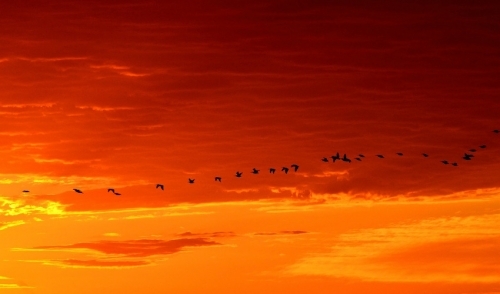 Daylight Levels: The amount of sunlight at different points in the earth's revolution around the sun is an instinctive trigger for birds that it is time to migrate. This lets birds know when seasons are changing and it is time to move between territories. For birds that migrate at night, the amount of moonlight can also impact their exact migration timing. Climate: Local weather and climate patterns, including storms and wind currents, can influence when birds migrate and how they keep to a migration schedule. A severe storm front, for example, may hurry birds along so they beat the bad weather, or it may cause birds to delay their migration temporarily so the weather can stabilize for easier flight. Food Availability: When preferred foods are available is a great influence for when birds migrate, and the bulk of migrating birds often pass through an area when foods are most abundant. This may mean the emergence of spring flowers or the maturity of fall seeds, depending on the season and the dietary preferences of migrating birds. Route: The exact timing of bird migration along a specific route can vary depending on any obstacles or hazards birds must overcome along the way. If a popular stopover oasis has been removed due to development, for example, it may take birds slightly longer to migrate through the area as they seek out new sources of food, water and shelter. Though each of these factors can impact the exact dates of bird migration, spring (March through May) and fall (late August through October) are still the peak periods for most bird movements. In general, birds keep to a fairly regular migration schedule, with variations of only a few days when these different factors come into play. Study social media reports or listserv sightings records to determine the most likely dates for different birds to return to your area. Record your own sightings in a journal, notebook or calendar from year to year. Also note general conditions of each sighting, such as weather or time of day. Consult with local birding groups, rescue organizations and wildlife centers for their sightings to create a more complete, comprehensive schedule. As you build your schedule, you'll be amazed at how punctual birds can be while on migration, and you'll learn to eagerly anticipate all their seasonal movements. When you know when to expect birds, you'll be able to fill your feeders with their favorite foods, brush up on your identification skills and get ready to enjoy all their visits.